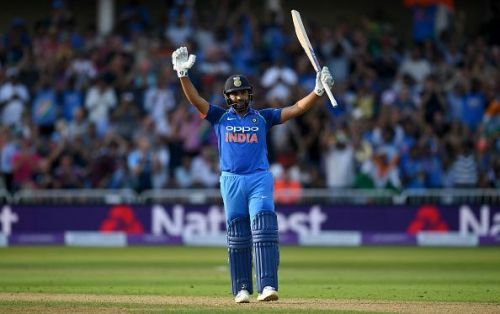 It is beyond any doubt that Rohit Sharma has taken his batting to a new level ever since he has been handed over the responsibility to open the innings in ODIs. He embraced this opportunity with open arms and has scored with an average of 60 since then. And in this process he has scored 19 of his overall 21 ODI centuries, crossing the 150 run mark for record 7 times. With 3 times converting those 150s into double centuries. He has also averaged in excess of 50 in all the calendar years since 2013. What is noteworthy is that since 2013, his innings played in the months of October and November make his numbers even more remarkable. He has played 30 ODI innings in the described period and has scored whopping 1918 runs at an average of 73.76 in those innings. 8 out of his 19 centuries as an opener have come in those 30 innings. 7 of those centuries have been 'Daddy Hundreds'. He scored 5 of his 7 scores of 150+ during this period which also include 2 double centuries. The epic innings of 264 runs was witnessed by Eden Garden on 13th November 2014. His innings of 209 at Bangalore in which he smashed a world record by delivering 16 shots over the fence was also played in November. Apart from these double hundreds, he also registered a score of 150 while playing against South Africa in Oct'15. Last year as well, he scored two of his mighty tons, one each against Australia and New Zealand in the month of October. Even his recent two knocks of 152* and 162 came in October this year. When Australia toured India in Oct-Nov'13, Rohit amassed 491 runs in the bilateral series against them. It came at an impressive average of 112.75 runs per innings. It is evident that during October & November, Rohit remains at the supremely best and plays cricket of the highest order. These numbers certainly indicate that October and November have turned out to be golden months in Rohit's limited over career. In fact, his affair with these months is not limited to ODIs only. He has scored all his 3 Test tons in the month of November which included a century against West Indies on his Test Debut. It was followed by another century in Mumbai Test Match, which is widely remembered as Sachin Tendulkar's last international match. His test average during this period is over 155 and is remarkably ahead of his overall career test average of 39. In the recently held T20I at Lucknow, he played a blistering knock of 111* on 6th November. Every year, Diwali falls during October/November and Rohit Sharma provides all the firework in the stadium in the midst of all the festivities.